Author Steven Little calls for everyone to be personally invested in his or her organization’s growth and not be afraid to see beyond inflexible policies to do the right thing. “Milkshake moments” which encourage growth, happen when individuals aren’t afraid to “mix it up” because they understand the organization’s true purpose and believe that it is their job to fulfill it. 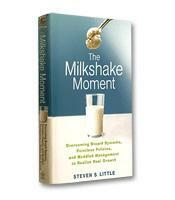 Growth guru Steven Little really likes milkshakes. So much so that he uses the promise of a thick, decadent vanilla milkshake to get himself through the drudgery of business travel. Sounds like a great plan, right? The only snag occurs when he checks into his hotel room and dials room service only to discover that this particular hotel’s kitchen does not have milkshakes on its menu. The employees serve vanilla ice cream and milk, but they don’t serve milkshakes and, therefore, cannot possibly mix one up. We’ve all been there. We find ourselves in the frustrating position of needing something so simple, so basic and so obvious, and yet we are kept from attaining what we need by a ridiculous rule or procedure. Our hope is that the person at the other end of our request will just forgo the policy in favor of doing the right thing, the obvious thing. In The Milkshake Moment: Overcoming Stupid Systems, Pointless Policies and Muddled Management to Realize Real Growth, Little calls these moments “Milkshake Moments”: when someone has the insight or the courage to see beyond the bureaucracy to do what is right. In The Milkshake Moment, Little discusses how these moments can be achieved and how the individual who embraces this way of thinking can forge a true path of leadership. Throughout The Milkshake Moment, Little investigates why many organizations are unable to foster true growth while many others can. He exhorts his readers to identify the ridiculous practices and policies stifling the growth of their organizations. Little doesn’t just spend his time trying to inspire his readers to embrace Milkshake-Moment thinking with idealistic prose. Instead, he provides specific, real-life examples to illustrate the principles he discusses in each chapter of his book. What makes these examples even more effective is that he provides descriptions of both milkshake makers and what he calls “stagnaters.” One example shows readers how the Vancouver Board of Trade not only grew its business by building a concrete purpose into its action plan, but also used this purpose to win the 2010 Winter Olympics for its city. Little also describes how The Home Depot lost its spot at the top of the big-box retailer market by losing sight of its main concern: the customer. Using real stories ith topics ranging from basketball to pharmaceuticals, from pomegranates to bartenders, Little packs The Milkshake Moment with relatable anecdotes that show readers how his concepts can help to foster real growth. Much of what Little covers may seem like common sense: Money should not be an organization’s ultimate motivator, edicts made on high by out-of-touch executives are not effective and true growth requires perseverance. However, as Little’s range of examples illustrates, it is often these concepts that we seem to forget. The Milkshake Moment serves as a reminder to organizations that they cannot afford to lose sight of these principles if they want to succeed.